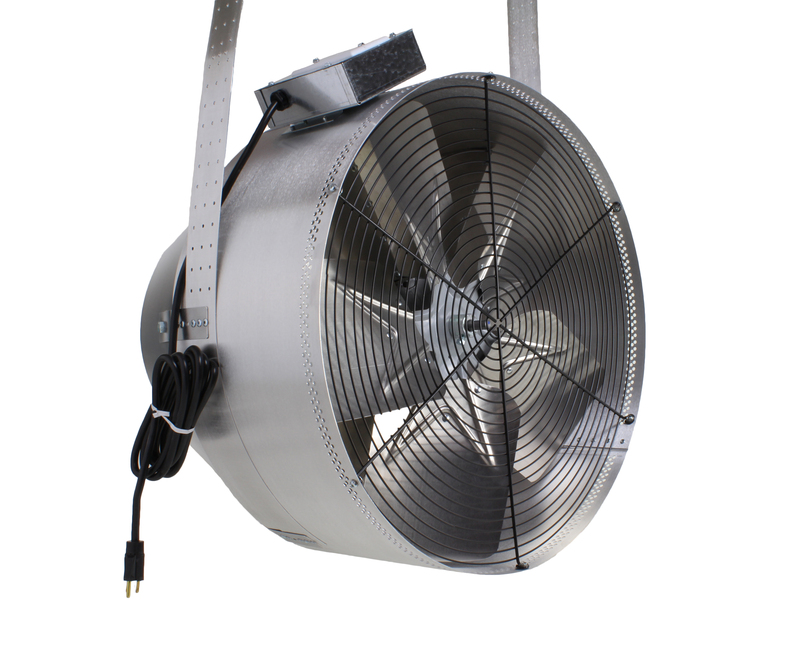 Our newest model of whole house fan, the 5.0e, is has been available on our website since spring. We’re extremely excited about it. Not only is this our first new fan in several years, but it is also our most powerful and our most efficient fan ever. Moreover, we’re manufacturing a greater portion of this fan “in-house” at our Medford, Oregon facility than any of our other fans. We’re also seeking a patent for some of the innovations behind its performance. As our patent is finally “pending”, we can now share the story of the 5.0e’s development. Now Introducing… Solar-powered Whole House Fans! Not really. The headline above is a little tongue-in-cheek. Readers of this blog will know our fans are designed to be run at night, when cool outdoor temperatures can be drawn indoors. Since photovoltaic cells can’t generate electricity at night, directly powering a whole house fan with solar generated electricity isn’t possible—unless, of course, one wants to run their fan during the day, which would heat the home rather than cool it! We do, however, frequently receive calls from homeowners wanting to know if they can run a whole house fan directly off of their home solar array. We wish they could. Because they’re a more efficient substitute for mechanical air conditioning, whole house fans greatly compliment solar by reducing the size of array needed to provide the same cooling. But again, photovoltaics don’t work at night. To operate a whole house fan with electricity generated by a solar array, homeowners need some sort of energy storage device that would allow them to store electricity they generate but do not use during the day. Then, this stored electricity could be drawn down through the night to power the whole house fan. In short, they need a battery—which is why we’ve followed Tesla’s recent announcement of their new Powerwall home battery system with great interest. Home battery systems have been available for some time now. But they have never been as prominent in the popular discourse as they are now, makings this the ideal moment for a blog post “back of the envelope” analysis about using a home battery to operate an AirScape fan. Carbon Dioxide emissions are in the news again as we experience more violent weather in 2014 and a drought in the west. We know our customers care about reducing energy consumption and the corresponding Carbon emission reduction. So when time came to upgrade our production machinery and assembly lines we made sure we choose equipment that has the lowest energy footprint possible. For example our high speed CNC punch is an AC servo motor driven turret which uses less than half the energy of a typical hydraulic machine and a 1/3 of the energy use of a machine of 15 years ago. In addition, we made the conscious choice to supply the energy required to produce our whole house fans from renewable sources. Today, our on-site Solar PV array provides all the energy required to power our cutting and punching equipment as well as a significant portion of our assembly line.